PhD students listen attentively during their 2014 convocation ceremony. Photo: Johnny Guatto. 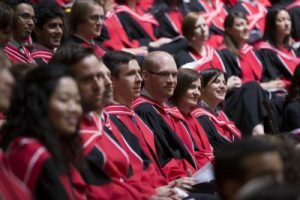 The four-year PhD program is designed for students with a substantial graduate background in philosophy (at least an MA at a comparable institution). The five-year PhD program is the direct-entry program for students with a Bachelor’s degree (or equivalent) in philosophy. The four-year program provides four years of funding and requires one year of coursework, while the five-year program provides five years of funding and requires two years of coursework. The course of study that leads to a PhD in philosophy includes course work and the submission, the satisfaction of the Qualifying Requirement, and writing and defence of a dissertation. Students are expected to work with at least two faculty members throughout the preparation of their dissertation. The department participates in one combined graduate program (Law and Philosophy) and six collaborative graduate programs. A student in the combined graduate program in Law and Philosophy completes both a JD and a PhD in philosophy. A student in one of the collaborative graduate programs completes a PhD in philosophy with distinctive requirements suited to their collaborative program, and receives a special notation on her or his transcripts at the end of the program. The following links give details on these programs.